People hating their country’s President is nothing new. Going around like this in almost every country. Same is the condition with the people of Pakistan and their hatred towards their President Asif Ali Zardari Bhutto. This weekend a Guy in Birmingham, UK threw a shoe on the President Zardari Bhutto showing his and all nations hatred towards him and his corrupt actions. Although the shoe didn’t reach Asif Ali Zardari, President of Pakistan, but it was still a shame for him and showed how much people respect him! There is this game which i came across (donno if it was recently made after the incident or was present before that) named Joota Khappy in which the users are supposed to throw a shoe at zardari and hit him with fire. I’m sure all Pakistani friends will specially be pleased to do so! 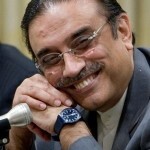 play the game and hit a shoe at Zardari and tell us the score you got. Disclaimer: This game is not created by me or any author at Nabtron. All credit goes to the developer who made it.